A woman from a big city moves to a small village near the former border zone between East and West Germany. What is she looking for? What will she encounter? Rural life in the era of globa­li­sa­tion turns into an adven­ture. History lives in objects, stories and customs here since it was first recorded 800 years ago. Wars and famines have left their traces, just as churches, poli­tical parties and various forms of govern­ment. The change of the times, struc­tured by tele­vi­sion, has almost obscu­rely changed the old rhythms of life; super­market offers changed eating habits and food stock economy. Is it folk­lore nost­algia or a matter of preser­ving one’s way and quality of life to keep the old customs and habits, such as preser­ving old types of plants and boiling down cucum­bers? The village - a mutual exch­ange of expe­ri­ences and garden products. The village is like an onion: it shows ever new surpri­sing layers and leads us deep into unwritten pasts. Germany 2001. Digital Beta, color and b/w, 90 minutes. 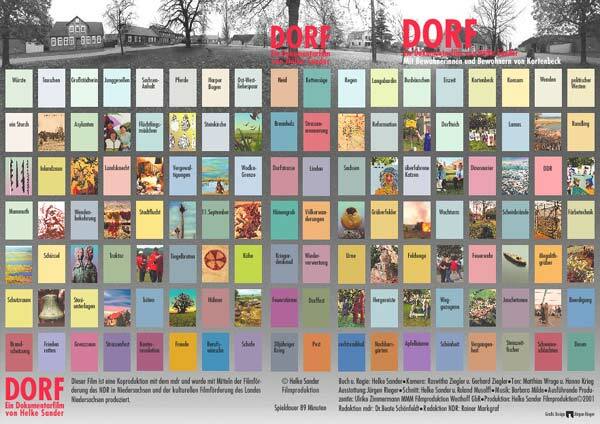 Produc­tion: Helke Sander Film­pro­duk­tion, in coope­ra­tion with mdr and NDR TV stations. Director and script: Helke Sander. Direc­ting assis­tant: Barbara Milde. Camera: Roswitha Ziegler, Gerhard Ziegler. Sound: Hanno Krieg, Matthias Wrage. Set Design: Jürgen Rieger. Cut: Helke Sander, Roland Musolff. Music: Barbara Milde. Produc­tion Manager: Ulrike Zimmer­mann. Editors: Beate Schön­feldt, Rainer Markgraf. First broad­cast: December 15, 2001. Premiere: November 11, 2001, in Salz­wedel, Germany (Film­pa­last Cinema).